I downloaded Word Spark to my Fire tablet on March 19. (It’s also available for iOS and Android devices.) There are 600 puzzles in all, grouped in 30 packs of 20 puzzles each. Working at the rate of about 4 puzzles a day, I completed the 600th puzzle today. * That puts me among the 0.02 percent of Word Spark users who have completed the entire set. This is a game for you if you have a good vocabulary (though arcane words are avoided), are good at pattern recognition, and are tenacious. That last condition is the crucial one. It separates the doers (conservatives) from the theoreticians (leftists). 1. Trace contiguous letters to form words. There are many possible words, but only a specific set of correct ones for each puzzle. Almost all of the words are singular common nouns and adjectives. There are many words that can also be used as verbs (e.g., park, scratch, walk). Rarely is there a word that is used only as a verb; proper nouns are equally rare; and adverbs, conjunctions, and prepositions aren’t used at all (as far as I can recall). You will save a lot of time by confining yourself to singular common nouns and adjectives. Don’t bother with plurals, they aren’t used. 5. If you are really stuck, use a hint. (A hint gives you the first letter of a word; you’re on your own after that.) You start out with 50 of them and gain 3 for every 20-pack that you complete. You can also gain a hint a day (until you reach the last 2 puzzles) by playing a 4 x 4 daily-exercise puzzle. (I didn’t discover this feature until I was in the next-to-last 20-pack of puzzles.) You can also buy hints, though I didn’t have to do that. 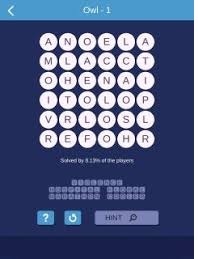 You should have plenty of hints to work with if you start doing the daily-exercise puzzle when you start playing Word Spark. Beware: Using hints too frequently may cause you to lose your edge, with the result that you have to use more hints. I found that I resorted to hints more often when I started earning an extra hint a day. This isn’t a spoiler. If you’re sharp enough and tenacious enough to reach the 600th puzzle, you will be able to figure this out on your own. This entry was posted in Culture - Language - The Arts, Intelligence - Personality - Psychology and tagged Word Spark. Bookmark the permalink.